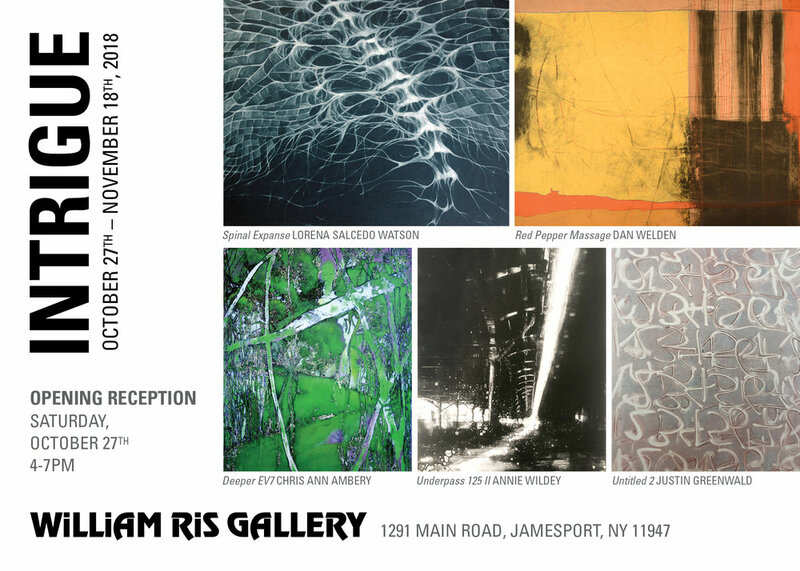 The William Ris Gallery is honored to present INTRIGUE featuring the artwork of five printmakers -- Dan Welden, Chris Ann Ambery, Annie Wildey, Justin Greenwald, and Lorena Salcedo Watson -- as well as sculpture Jonathan Pearlman, from October 27 through November 18, 2018. The innovative and highly evolved printmaking artwork featured in INTRIGUE skirts the perimeters of the abstract and actual, of fantasy and reality. Printmaker Chris Ann Ambery, who helped to curate and organize the printmakers, explains, “I was drawn to the fact that all five of us have kind of a foot in reality and abstraction at the same time, going back and forth. I feel we each have a very unique expression.” All of the printmaking artwork is created organically in that the prints are pulled by hand, none are digitally created. Gallery owner Mary Cantone is a longtime collector of etchings, lithography and woodblock prints. “It’s what started my art collection,” shares Cantone. “I think it’s so complex with all its stages and steps, the textures created...I find the whole process intriguing.” Hence the exhibition title. pieces with their layers of repetitive imagery like a Philip Glass composition that give off a multi-dimensional texture, the cohesion of each artists’ work flow together like the individual instruments in a complex symphony. The printmakers’ works will include the full spectrum of printmaking, and all artwork exhibited will be limited editions and unique one of a kind monoprints and monotypes. “Each artist has incredible mark making abilities,” Ambery says. Asked to define what mark making means, she explains, “It happens in all forms of art. It’s drawing and developing a language that each artist fosters.” And there is no doubt, each artist will be making their mark with INTRIGUE.